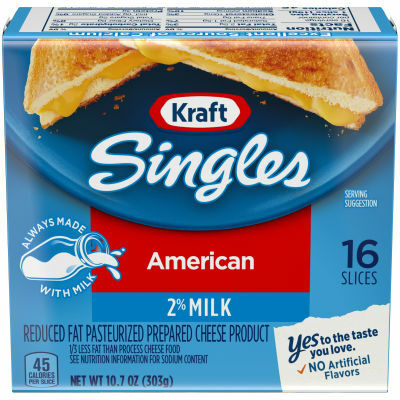 Discover delicious 2% Milk American cheese slices from Kraft Singles. These reduced fat cheese slices make it easy for you to prepare tasty sandwich lunches, yummy grilled cheese, and delicious cheeseburgers. With 1/3 less fat than regular American cheese, they are a smart food choice your whole family will love. Serving size 1 slice (19g).